Do you have a photo of Vailsburg? Lydia Lindsley's house was built around 1760 A.D. It was a local tradition that George Washington used it as his head quarter's during the Battle of Springfield in 1780 A.D. This house was located on Stuyvesant Avenue near Silver Street. It faced east and was 300' from the Elizabeth River (Brookdale Avenue). Around 1900 A.D. a Mr. Weeder owned this house. He was the old lamp lighter who traveled by horse and wagon throughout the streets of Vailsburg tending the the gaslights. It was torn down in 1965 A.D. and was replaced by a small apartment complex. In the late 1940's as a young newspaper boy for the Newark Star Ledger I visited this house many times. It was a one story building and the main entrance was around 6 feet above Stuyvesant Avenue. The living room floor was made of 6" wide wooden planks. The kitchen had a large brick oven (used for baking) in it's fireplace. When it was torn down 37 years ago I tried to salvage portions of it. I retrieved two large beams and a portion of the brick oven. I have a portions of the pegged beams (tendon and mortise) with roman numerals carved on them. The roman numerals were evidently used to identify each beam. I never seen this done before because the beams were made on site. There would be no need to identify them during construction. It's my contention that this house may have been moved to its present location in the early 1700's. The first school in Vailsburg was a one room school house built in 1850 A.D. when this area was still part of South Orange Township. It was called Columbia School. It was located on South Orange Avenue near Boylan Street Pool. The building was used in later years as Charlie's Bike Shop. The building next store to it was ABCO Auto Parts Store. Another school was built on Alexander Street in 1895 A.D. This building was much larger and could accommodate more students ; however, it soon proved to be to small for a growing population. It was replaced by the present day Alexander Street School. The older building was moved to 128 Brookdale Avenue where it now serves as a two family house. Shortly after the Civil War, Dr. Vail and several of his friends raised $50,000.00 and constructed a a horse car line (a trolley car pulled by a horse) on South Orange Avenue. The Car ran from Boston Street (three blocks up from High Street) to Munn Avenue. Dr. Vail was superintendent of construction and conductor on its maiden trip from Newark. The fair at that time was six cents. While the Orange Horse Car Railroad was a progressive adventure it turned out to be a financial failure because it was ahead of it's time. James Boylan ( source of the name for Boylan Street ) took over the line and also failed. It wasn't until John Radel bought it in 1877 A.D. that it proved to be a great success. By then the crowds from the lower portions of Newark had discovered Scheutzen Park (Vailsburg Park) and used the line to visit it frequently. This line was also primarily responsible for the rapid growth and development of Vailsburg. It provided a means of transportation for those who wanted to work in Newark and live in the suburbs. The original horse car stables were still standing in the late 60's. They were opposite Brookwood Street in the rear of a gas station. There is a tradition that Washington and some of his men stayed here during the Revolution. In 1797 A.D. (Battle of Springfield). Aaron Baldwin owned this property and willed it to his son Joel. The map at that time, dated September 7,1797 A.D., showed the old house on South Orange Avenue, which at that time made a north -east turn near what is now Munn avenue. The road was much higher than it is now. South Orange Avenue is referred to as "The Road "and Munn Avenue as " the road running from the main road to North Orange ." In my research I came across this house many times. This area was also called "Dogs Misery ". The house was probably built prior to 1717 A.D. Aaron Baldwin owned slaves ( slaves in Vailsburg). Unfortunately this house was demolished in circa 1960 and replaced by Kravet's Pharmacy. Vailsburg was named after Dr. Malcolm Vail. I believe he was a medical doctor. He was the first mayor of the Borough of Vailsburg and he lived on Vail Street near Kenmore Avenue. 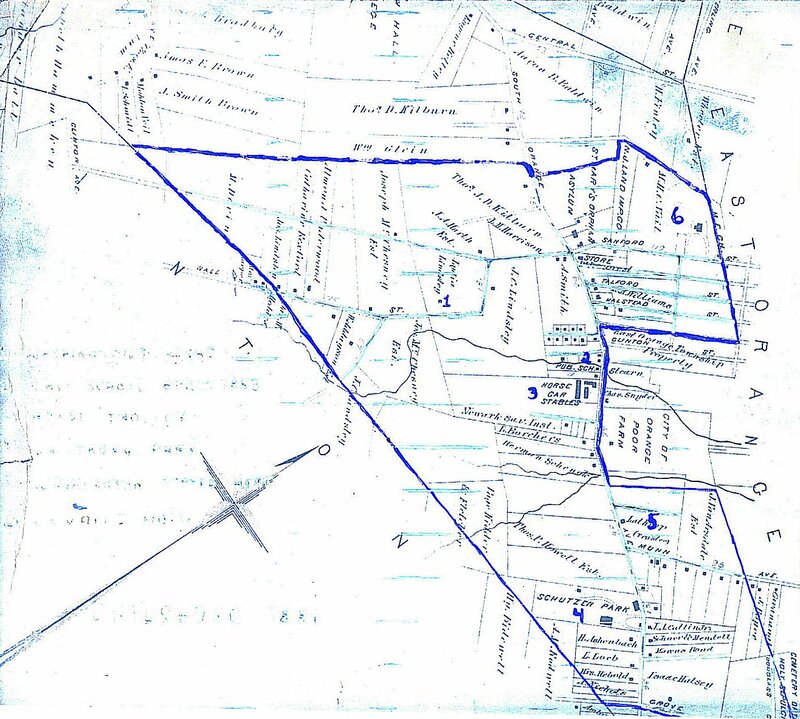 The area we know as Vailsburg was once part of Clinton Township and later it became part of South Orange Township. From 1895 -1905 A.D. this area became the Borough of Vailsburg. In 1905 A.D. it became part of Newark. In 1881 Mr. Albert Smith who later became the Mayor of Vailsburg owned the property on the southeast corner of South Orange and Sandford Avenues. This was the homestead of Joshua O. Baldwin's. This house was built in the latter portion of the 1700's . Around 1900 A.D. It was known as the Raub Homestead. It's wide front porch and broad lawn containing a brook (branch of the Elizabeth River) faced South Orange Avenue. This home was the scene of many annual Fourth of July celebrations. These took place while Vailsburg was a independent borough (1895-1905 A.D. ). It was later remodeled although most of the old time charm remained. I'm sure many of us remember it as Burn's Funeral Home. Today it's a private residence?